"Social Maturity Index:Determine your brand’s social maturity"
Every business needs to develop a customer centric strategy. It's how you identify and engage with new customers, and it's your front line for real-time customer service with new generations of users. With businesses still figuring out exactly how to measure social effectiveness and providing the best customer experience, an evaluation method called Social Maturity index (SMI) was created, for brands to map out their accurate position on the maturity scale. 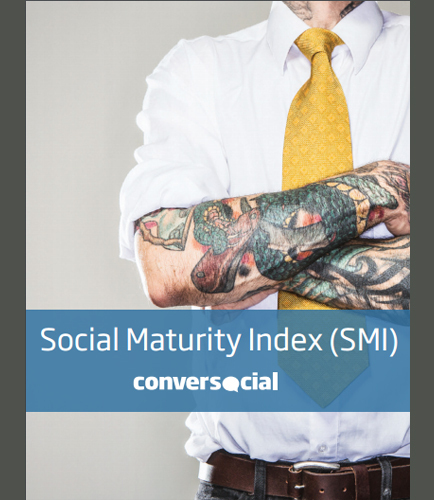 What is Social Maturity, and why do we need an index? How can you determine your brand’s social maturity? What are the indicators of robust innovation to extraordinary Social Media experiences? What actually defines a Socially Mature Brand? How do social media contribute to the customer experience? Download this informative whitepaper to learn how to enhance customer experience with social media and how SMI acts as a roadmap, an outline for the socially maturing brand. How important is the digital customer experience innovation? Creating a compelling digital customer experience has become the challenge for any business today. How can we retain a customer who never visits any branch physically? Maintaining customer relationship is the key to business success. Managing customers is not an easy task but an impossible one, and more importantly not an act of faith, but mainly a common sense journey. The challenge is how we do create a digital experience so compelling that our new and old customers would embrace it with the same or even more enthusiasm as they do with traditional face to face experience. This whitepaper presents a very pragmatic and easy to follow recipe, and other magical tech ingredients together to produce the best digital experience for your customer at the lowest possible cost, so we can call it “The recipe to your digital success”. Download this whitepaper to learn more about improving customer experience through digitization and the right ways to create a great digital experience. Is yours a truly customer-centric organization?Is your business truly being customer-focused? Increased customer satisfaction is becoming the top metric used to measure success of field service organizations (FSO). Indicator of customer success implies repeat purchase decisions, new customer referrals, and extended revenue for the service operation. What are the impacts of increasing customer satisfaction on profitability? This whitepaper discusses about driving efficient business processes through increased customer satisfaction and provides brief insight on: Steps for creating a customer-centric culture in organisations Key elements of customer transformation strategy What are the essential strategies to increase customer satisfaction? How Open Call Management (OCM) process has enhanced customer satisfaction. Selecting the right field service management software to enhance customer satisfaction From this white paper you’ll get to know how field service management has changed significantly and why field service organizations are focusing more on increased customer satisfaction to improve their brand image. What is Customer service ?